From a bird’s eye view, the campus at the American University of Beirut stands out as a lush green landscape in the densely built up city. The steep topography of the Middle Campus cascades down to the Corniche Boulevard, providing beautiful vignettes of Mediterranean Sea as one descends from the Upper Campus to the Lower Campus. The Middle Campus is forested and populated with wild birds that migrate through Lebanon. To make connections between the key campuses and to enhance the most memorable aspects of the landscape, the University asked VJAA to develop a prototypical stair design that could be used at key locations to unite all three campuses. 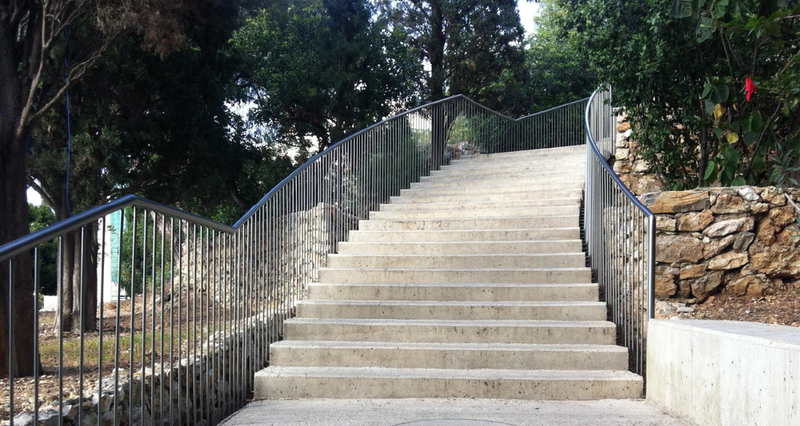 The lyrical sequence of arced stairs and landings traverse the irregular, stony hillside descending 30 meters vertically. The cast-in-place concrete design is both modular and adaptive to the many eccentric conditions of the Middle Campus.